CNBC Money Expert Gary Kaminsky Reveals the Wealth-Building Secrets of Wall Street Insiders "Gary Kaminsky is one of the top money managers of the last two decades. His book is a must-read for anyone trying to make real money in the stock market!" Nils Brous, Founding Principal, Samson Capital Advisors, LLC; Chairman, Arcoda Capital Management LP; former executive, Kohlberg, Kravis, Roberts and Company (KKR) "Want to know how the best managers and traders on Wall Street make money? Read Gary Kaminsky's down-to-earth, money-making guide and learn the secrets of profiting in any market." Melissa Lee, Host, CNBC's "Fast Money" "A must-read! Gary Kaminsky takes the mystery out of the market with his no-nonsense, take-no-prisoners approach." Jeffrey Moslow, Managing Director, Investment Banking, Goldman Sachs The Book Wall Street Doesn't Want You to ReadHow do savvy Wall Street investors achieve high returns even in the worst financial times? It's one of the industry's best-kept secrets-and now it's yours for the taking. Gary Kaminsky, cohost of CNBC's "The StrategySession"-and one of the best money managers inWall Street's recent history-is ready to share the secrets that have made his colleagues millions, even billions, of dollars. These simple but powerful techniques are not exclusive to Wall Street's high rollers. With Kaminsky's system, you will make money even in zero-growth markets. His proven formula shows you how to: Develop the same habits, reflexes, and practices of top market performersCreate a proactive buy-and-sell strategyBeat the roller-coaster market trends-and focus on long-term returnsMake smarter, more informed decisions-and more money! Kaminsky brings more than two decades of experience to his low-risk, high-return system, demystifying Wall Street for novice and seasoned investors alike. Between 1999 and 2008, Kaminsky's team at Neuberger Berman grew record-breaking returns far above the S&P benchmark. And they didn't do it by magic. They did it by constructing a specificstrategy and sticking to it, regardless of the investing climate. It is a strategy that anyone can learn and apply, step-by-step, in any market. With Kaminsky's expert guidance, you'll learn how to be more disciplined and vigilant with your investments, maximizing your returns in a minimum amount of time. You'll not only make money in most markets, but you'll lose much less money when those around you are losing their shirts. And you'll be able to strengthen and protect your assets-particularly in the slow-growth decade ahead-with the confidence and know-how that drives Wall Street's smartest investors to the top of their game. 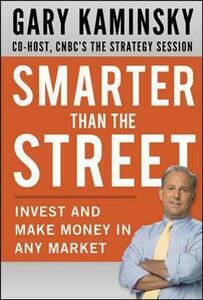 Yes, you can beat the market-when you're Smarter Than the Street.